Last week, I posted a quick survey for all you fellow nerds to partake in. This week, I’ve compiled some of the results. It seems, that most of the fans that participated in the survey seemed to be fans that have grown up with the newer Hollywood adaptations of superhero-inspired films. I say this because majority of the results favored more recent and currently trending movies or video game systems/styles. For example, majority of participants acknowledged The Dark Knight Trilogy as one of their favorite films, but the older Star Wars films received a rather lackluster amount of praise. 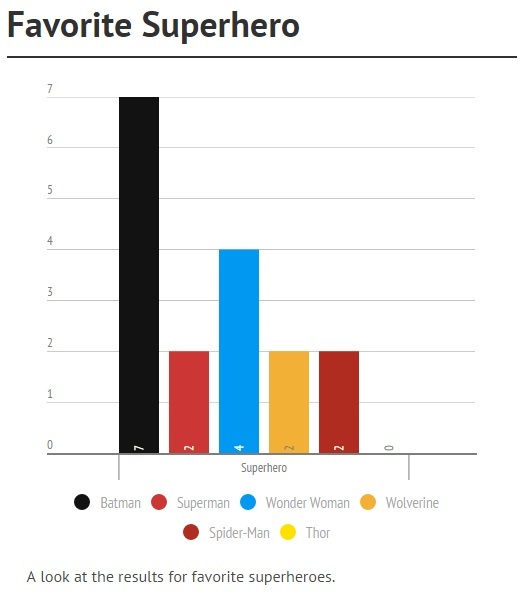 It also seemed that most of the participants enjoyed superhero films and video games, but wouldn’t necessarily categorize themselves as ‘nerds.’ Majority of fans seemed to read both DC and Marvel comics and naturally casual gamers seemed to dabble in both comics and video games. None the less some very interesting results and a big thanks to all those who participated! Take a look at the results here! This entry was posted in Geek Culture and tagged Batman vs Superman, Captain America: Civil War, DC Comics, Deadpool, geek culture, Marvel, Star Wars, Suicide Squad, Superhero films, video games. Bookmark the permalink.